So you just got a new boat and you want to take your dog for a ride. 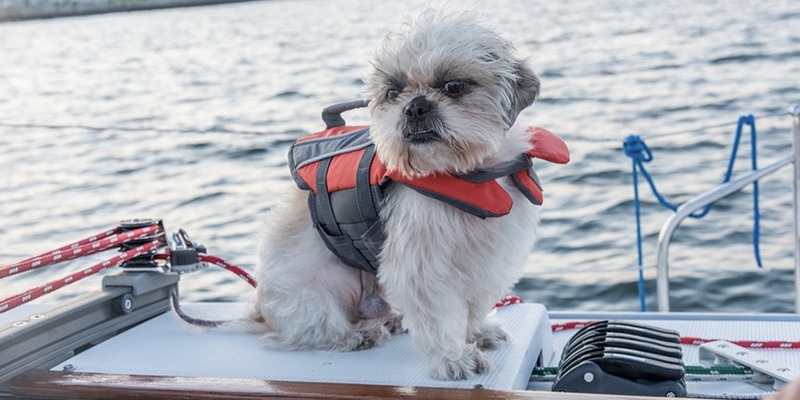 Before you go out, get a doggie life vest. Yes they do make these!! Be sure he is fitted properly and get him used to it before heading out on the water. Once at the boat, before putting in the water, get the dog used to it, let him explore, sniff around and maybe leave treats here and there. You want this to be a pleasant experience. First trip out , take a short trip, make sure he is secure and bring a first aid kit. Have a plan in case the dog jumps overboard. Go with another person until the dog is used to it. You don’t want to scare him or put him in danger. Never leave the dog alone on the boat or pull behind on a raft. They also have water ramps to assist the dog coming in from a day of swimming to get back on the boat.Be sure to bring fresh water, treats and make sure if a hot day he has a shady place to lay down before swimming. Check with Local lakes too on rules when boating with your dog. These will also apply to kayaking or canoeing. This will be a fun activity for you and your dog, so plan ahead and happy boating. Your dog can get sea sick too so be sure you have clean up supplies and check with your vet on how to cure nausea. Bring lots of water toys to play in the water and after the day is done you will have one happy pooped out pooch! !